Shakhtar Donetsk were free to pick midfielder Fred for a Champions League match, despite him failing a doping test say Uefa. Fenerbahce argued that the Brazilian should not have played in the teams' 0-0 draw last week after he tested positive for a banned diuretic at the recent Copa America in Chile. 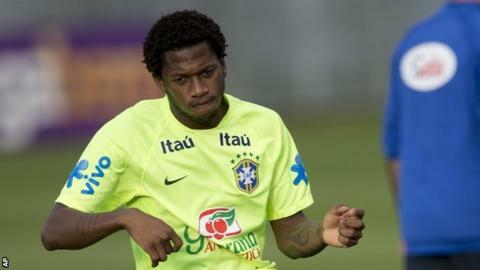 While Uefa advised Shakhtar not to pick Fred, the power to ban him rests with South American confederation Conmebol. The substance can hide the presence of other drugs and the 22-year-old faces a ban should a second sample confirm the findings of the first test. "I trust in my innocence and I am going to prove it to the proper authorities," Fred said in a statement. Shakhtar host Turkish side Fenerbahce in the second leg of their tie on 5 August with the winners advancing to the Champions League play-off for a place in the group stage. Called up for the injured Luiz Gustavo, Fred played in Brazil's opening two fixtures at the Copa America but was dropped for the final group game against Venezuela and quarter-final defeat by Paraguay.